Savoring Kentucky thanks University of Kentucky Communication Intern Anne Marie Kirk—now an honor graduate—for her assistance, and we send every good wish along with her as she begins her new work life. Anne Marie prepared this post as her final internship project. As I walked the grounds of the Lexington Distillery District, feelings of promise overwhelmed me. This area, which lies along Manchester Street and northwest of Rupp Arena, includes many new and expanding businesses operating in historic buildings that once comprised the James E. Pepper Distillery, which ended production in 1969. The name for the reborn retail area? The Pepper Campus. The buildings’ industrial facades contrast with the vibrant businesses inside the brick walls. Lexingtonians: expect excitement when you visit this area of downtown. In June, 2015, Crank & Boom Craft Ice Cream will open its new ice cream store at 1210 Manchester Street, joining other new businesses making their homes on the Pepper Campus. In late April, I met and interviewed Toa Green, Crank & Boom’s creator, owner and Master Ice Cream Crafter. Toa gave me a tour and introduced me to the plans for Crank & Boom’s flagship store. Toa first began making ice cream two years ago, using a 2-quart Cuisinart. She wanted to re-create a coconut variety popular in Thailand. The new ice cream debuted at a public event in May, 2013. She sold the ice cream at Thai Orchid Cafe, a restaurant on South Broadway her family owned and operated. Customers’ positive reception inspired Toa to make new flavors of ice cream and work to develop a locally recognized brand. Since Crank & Boom’s first public event in May 2013, Toa’s ice cream business has outgrown her small Cuisinart. To meet the demand, Toa now creates multiple flavors of craft ice cream in a commercial machine, churning out 6 quarts in 8 minutes. Toa explained that she had not intended to build a brick and mortar store when she began Crank & Boom. The decision to create a physical location came from public interest—Lexingtonians wanted a Crank & Boom store. The developing Lexington Distillery District seemed like the perfect place to set up shop. The features of the 1930s era building guided the design for Crank & Boom’s new home. Exposed beams and bricks and the proposed warm color palette set a loungey tone for the store. In addition to ice cream, Crank & Boom will feature a full-service espresso and chocolate bar. An outside patio offers seating for customers to enjoy the refreshing summer weather. The second floor provides a space for extra seating or party rental. I found my favorite feature of the store on the upper level: an antique, walk-in safe previously used for the James E. Pepper Distillery that will be converted to a photo booth. 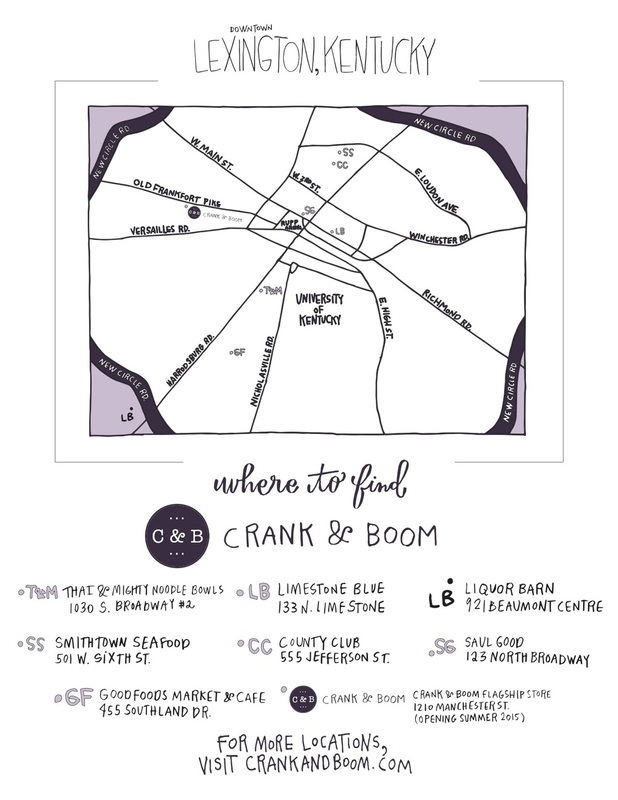 With all of the exciting and unique features to look forward to, I predict that Crank & Boom will be the hot spot in Lexington this summer. A long-time champion of local food and local producers, Toa plans to use Kentucky products and Kentucky tastes in the 12 flavors of ice cream customers will find at the shop (six staple flavors and six seasonal flavors). See the initial list of producers below. You support these Kentucky producers when you buy Crank & Boom ice cream. A huge THANK YOU to Toa Green! I expect her business will continue its exponential growth with this new presence in one of Lexington’s vital new retail development areas. Toa was so helpful when showing me the Distillery District and I am filled with excited anticipation to see how this area develops.